HONOLULU—Hawaii is the focus of a multi-page special section in the December issue of Hemispheres, the in-flight magazine of United Airlines. Dossier, Hemispheres’ Economic Development series, features Hawaii with in an in-depth overview, including showcasing unique initiatives that shape the state’s industry and commerce, as well as its influence on today’s global economy. The special section examines Hawaii’s diverse economy and features interviews with local business leaders and economic development experts. It profiles of some of the state’s business innovators and entrepreneurs, including Hawaii Gov. David Ige, University of Hawaii President David Lassner, Queen’s Health Systems President and CEO Art Ushijima, and Hawaii Pacific University President John Gotanda. Gov. David Ige is featured as “The Influencer” in the issue, where he shares the inside track of his vision and priorities for the State of Hawaii. The Department of Business, Economic Development and Tourism (DBEDT), and its attached agencies were well-represented in the special feature with interviews that focused on Hawaii’s innovation economy, from DBEDT Director Luis P. Salaveria, Hawaii State Energy Office Administrator Mark Glick, Creative Industries Division Chief and founder of the Creative Lab Hawaii Program Georja Skinner, Hawaii Strategic Development Corporation President Karl Fooks, and High Technology Development Corporation CEO and Executive Officer Robbie Melton. 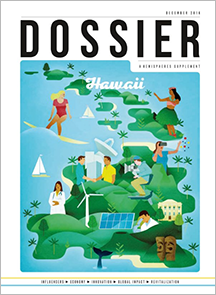 Dossier focuses on Hawaii’s key areas of innovation technology, the creative sectors, clean energy, and more. The section is designed to appeal to the majority of United Airlines’ customers who are business customers. United Airlines and United Express operate more than 4,500 flights a day to 339 airports across five continents. In 2015, United and United Express operated more than 1.5 million flights carrying more than 140 million customers. United is proud to have the world’s most comprehensive route network, including U.S. mainland hubs in Chicago, Denver, Houston, Los Angeles, New York/Newark, San Francisco and Washington, D.C. The Hemispheres magazine with the Dossier Hawaii special section is online and in every seat pocket of every United flight worldwide throughout the month of December. The magazine has more than 3.1 million unique readers every month.